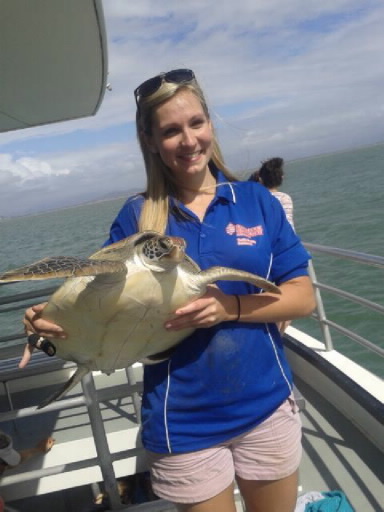 JCU scientists have been granted nearly $90,000 by a charitable trust to map sea turtle “high risk hotspots” along the Queensland coast, which will allow environmental managers to focus on areas needing the most attention. The endangered turtles spend a lot of time in coastal areas feeding and nesting in near-shore habitats that are critical to their survival. Martha Brians from the Estuary and Coastal Wetland Research Group said when these areas overlap with places humans use, the animals can be severely impacted. Ms Brians will create a map of turtle concentrations along the Queensland coast and then add threats such as urban development. This research will pinpoint where the highest risk areas are so that management efforts can be better directed. She will travel the coast in search of turtle ‘hotspots’ following up information from scientists and volunteer community turtle groups. The study will produced a precise Geographic Information Systems (GIS) map that shows high risk turtle hotspots that are vulnerable to threats along the QLD coast. “This information will help managers target their effort on areas where small changes can greatly benefit turtles,” she said. The study is expected to take a year to complete and will involve two separate expeditions north and south of Townsville.